Whitewashing or painting are the most common methods of ceiling decoration, which can be used in the interior of almost any room: living room, bathroom or kitchen. But what is still better: to whitewash ceilings or paint? Whitewashed ceiling seen by every person. Accordingly, no need to explain what it is. But the advantages and disadvantages of this method of finishing is to examine more closely. Unquestionable advantage of whitewash is its low cost. In addition, to handle a ceiling surface of such material is quite simple — it can be done independently, not resorting to services of the workers. But when applied should consider the main thing — do not treat with Cretaceous whitewashing existing lime and Vice versa, otherwise the ceiling may appear unsightly yellow stains and will have to redo everything. The disadvantages of this method of finishing the ceiling can be attributed to the rather short period of operation whitewash — in a few years it will begin to crack and crumble. In addition, it is desirable to use the plaster in rooms with high humidity and frequent temperature changes. And what about the paint? Painted ceiling surface, as with whitewash, today is also no surprise. For these purposes, usually use latex paint. The advantage of paint, before painting, is that a painted ceiling can be washed. It has excellent resistance to contact with water (of course in small quantities). Again, to paint the ceiling it is possible independently, and quite quickly. Paint perfect for any surface: wood, brick, concrete, etc. Of the disadvantages of this method of finishing the ceiling you can name a few main ones: first of all, the fragility and rapid loss of the original color. In addition, if under the paint you will get a large amount of moisture, it will begin to pull away from the ceiling surface. Accordingly, there is a need to re-staining the ceiling, and it is much more difficult — you have to first remove the old layer of paint, then to align the ceiling and only after all the above actions it will be possible to begin a new painting. So what is better? Whitewash or paint? It depends on where you plan to repair the ceiling surface. For the ceiling in the kitchen or bathroom, it is best to use paint, as it can withstand a certain level of humidity. But for living room, children room or bedroom is most suitable whitewash, which, though "afraid" of water, but improves the circulation in these areas, which is especially important for children. Paint for whitewashing is possible only in case of emergency, if the whitewash is well kept and deposited in a thin layer. In all other cases you will have to completely remove the lime and only after that to start colouring. If you need to paint the walls and ceiling with latex paint on a layer of regular lime, then it can be done immediately, if lime is not applied in a thick layer and not eliminated. Vodoemulsionka with any color great falls on the ordinary lime and does not require preliminary preparation of surfaces. 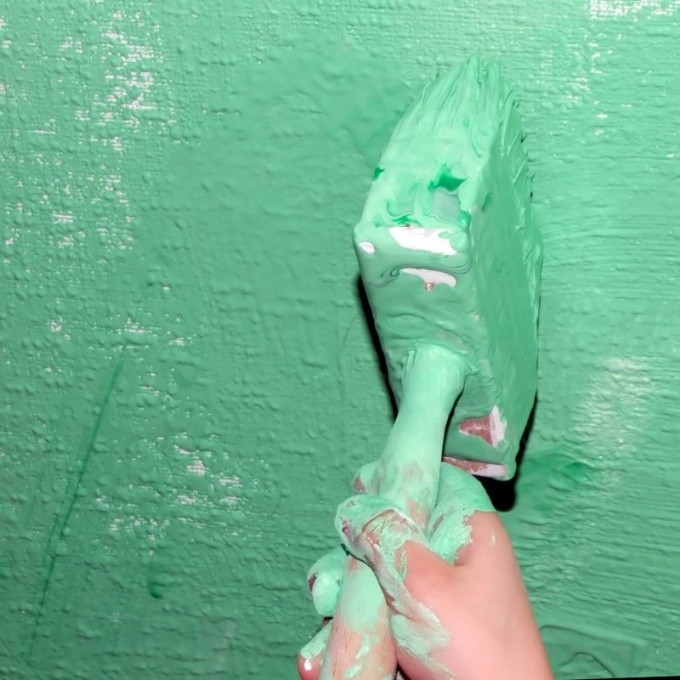 In the presence of a thick layer of lime will scrape off the entire layer with a spatula, fill the walls and only after that start colouring. If you plan to paint whitewashed walls enamel, you will have to remove the entire layer of lime, because over time, all of the enamel will flake off along with the former whitewash. To remove a thick layer of lime use a spatula. A thin layer is enough to wet and wash with a brush. If you have a sander for final leveling of the walls, use it with emery paper No. 0. Remember when sanding to wear a respirator, glasses, open all the Windows and doors, as the dust from the lime is very toxic. Before painting, Prime the walls with Wallpaper paste, varnish or dilute the paint that you will apply in the ratio of 1:5 and apply two coats on unpainted surface. After 24 hours, immediate start staining. The core layer of the enamel, apply with a brush, roller or spray gun. If you use a roller or brush, it is sufficient to paint the surface in two layers. After the first painting to let the paint dry completely for 24 hours then apply a second coat. If you use a spray gun, you will need the triple coating of paint, as the paint coat goes on more subtly and double staining is not always effective and gives a smooth opaque layer. When using the spray gun as you would with a brush or roller, each layer needs to dry completely, after which you can apply the next layer. 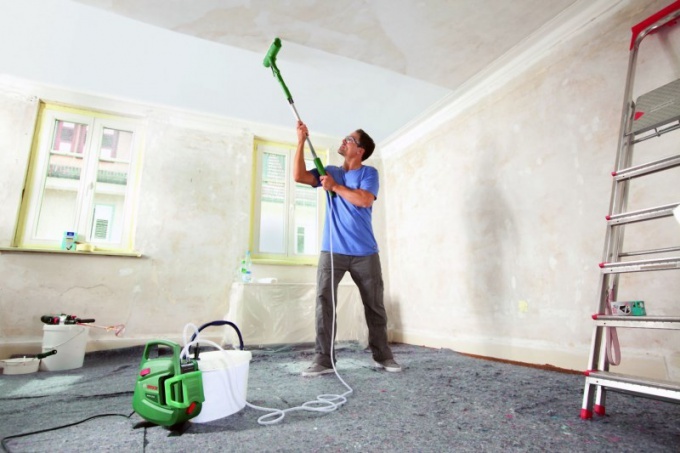 Advice 3 : Is it better to whitewash ceilings or paint? Repairs in a new apartment is very interesting, but nevertheless a difficult and responsible action. The main problem of those who are doing it yourself arises when painting ceilings. Previously, all the ceilings were whitewashed because no other options existed. Chalk for painting ceilings still in use today, due to the very low material cost. Compared even with the cheapest latex paint, whitewash is worth mere pennies. But those who decided on the plaster of the ceiling, should understand that their hands will create a real dust collector. After all, Mel will attract all the dirt that cannot be removed as the chalk whitewash creates an absolute unstable to wash the floors. So experts recommend to whitewash ceilings in the bathroom, the toilet and the kitchen. Because that is where the ceiling should have waterproof properties. In addition, Mel with temperature changes may begin to crack and crumble. In stores there is a large selection of colors for ceilings, but do not chase the cheap, because in this case, the coating is not durable. And moisture the paint will flake off and, therefore, each room should choose the appropriate coverage. 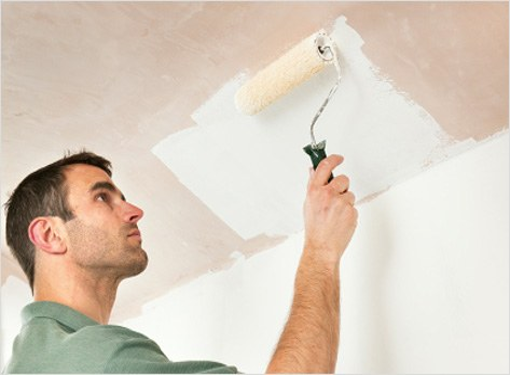 Before using water paint the ceiling must be primed 1-2 times. The big advantage of water-based paints is their ease of application, they give almost no streaks and splashes, in contrast to the whitewashing, painting them is a pleasure. Some compounds have such density that not even drain from the roller. In addition, the ceiling of which is painted with water-based composition can be washed with the use of various assistive devices. This property is especially useful for rooms with high exploitation: kitchens and hallways. Whitewash or latex paint should be applied only velour roller to get an even finish. If the choice falls on the plaster ceiling, it should be understood that tinting coating will have once in two years. But water-based formulations are able to serve up to 10 years without upgrading.